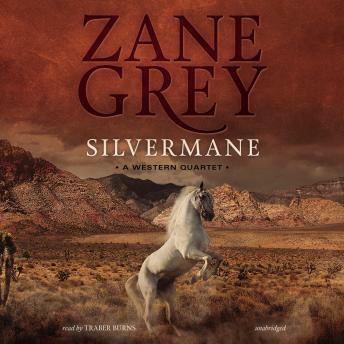 From beloved author Zane Grey come four thrilling tales of the West. The very essence of the American West can be found in the stories of Zane Grey, an author whose popularity has not flagged since his first novel was published. "Silvermane" is concerned with the efforts of two Mormon mustangers, brothers Lee and Cuth Stewart, to capture a wild stallion in the Sevier range country. "Tappan's Burro," with the text restored from the author's handwritten manuscript, tells of the life of a desert prospector and his burro, Jenet. Tappan dreams of finding gold-and does. When he is pursued by claim jumpers, it is Jenet who guides him across the floor of Death Valley when it is beset by suffocating gales of nocturnal heat and gas. "Cañon Walls," also restored according to the author's holographic manuscript, is the story of outlaw Smoke Bellew, who enters a remote Mormon settlement only a jump ahead of a posse. Finding employment as a ranch hand working for a dowager Mormon, Smoke is able to make her ranch a financial success while simultaneously falling in love with her wanton daughter, Rebecca. But it is too good to last. "From Missouri," its text restored as well, is a story about a schoolteacher from the East who is discouraged from coming to Arizona Territory by letters forged by three cowhands. But the mysterious Frank Owens' love letters convince her she must come anyway. When Jane Stacey does arrive, to the amazement of the three cowhands, she is not the middle-aged matron they had expected but a young and very attractive woman. However, the lecherous Beady Jones has his own idea of how the new schoolmarm should be introduced to the West.